MainAll NewsJewish WorldThe End of Autopsies in Israel? The End of Autopsies in Israel? A new MRI system could bring an end to autopsies in Israel, resolving a divisive rift between religious Jews and the secular state. Court mandated autopsies, long a problematic and divisive issue for many religious Jews, could become a thing of the past in Israel. A new MRI device that can accurately determine cause of death without autopsies was inaugurated Tuesday afternoon at Assaf Harofeh Hospital. The systems are in use in several places abroad, and allow doctors to conduct a “virtual autopsy,” viewing the inside of the body and observing the condition of organs and other internal components without the need to cut open the body. The systems have been around for several years, but recent technological improvements make the scans far more accurate than they were in the past – to the extent that many doctors feel that they can rely on the results produced by the MRI. Participating in the ceremony, among others, were Deputy Health Minister Ya'akov Litzman, Deputy Finance Minister Yitachak Cohen, and Zaka chairman Yehuda Meshi-Zahav. Litzman said that the installation of the MRI was a historic event, because it provided a technological solution to one of the most divisive issues in Israeli life – the insistence of police and medical authorities on conducting autopsies in cases where the cause of death is not clear, and the resistance by religious – and specifically Hareidi – communities to autopsies, resistance that in the past has resulted in large-scale demonstrations and protests, arrests, and even the removal of bodies from the Pathological Institute in Tel Aviv. 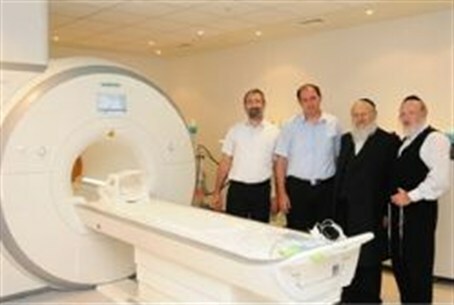 Litzman thanked Zaka for its efforts in acquiring the machine, and praised Meshi-Zahav for his determination to convince medical authorities that the MRI produced results that were at least as good, if not better, than physical autopsies, and had the added benefit of defusing what in the past has been a very divisive issue. Meshi-Zahav said that Zaka has been working on acquiring the machine and getting approval for its use for over five years, meeting numerous times with top officials, including Chief Pathologist Yehuda Hiss. Also instrumental in providing an impetus for the acquisition of the machine was Harav Nachum Kook z”tl, who for many years worked ceaselessly to prevent autopsies whenever possible.